The education level of a population is critical to its future, he says, but is often overlooked in favor of focusing purely on age structure (e.g., the number of young people). Lutz cited the case of Singapore, where rapid fertility declines accompanied an economic boom last century. It wasn’t only that there was better access to reproductive health services or declining poverty levels that created such a “demographic dividend,” it was also that young people, almost universally, had primary and secondary schooling – something very few of their parents could say. In a new book, World Population and Human Capital in the 21st Century, Lutz and colleagues from the Wittgenstein Center explore this “education effect” on population growth, finding that access to primary and secondary schooling is just as important as access to family planning and economic growth in how many children people choose to have. Although there are a myriad of things that go into individual choices (or lack thereof) about family size, Lutz says they were able to demonstrate “functional causality” between education and fertility. Going to school, he says, physically changes the brain, enhancing critical cognitive skills, including the ability to plan more carefully, learn from mistakes, and avoid risky behavior. These changes, coupled with the expanded employment opportunities that education opens, lead to more people living stable, healthier lives, and planning to invest more resources in fewer children. These findings have important implications for the future, Lutz says. The age structures of many sub-Saharan African countries, which are the youngest and most rapidly growing in the world, look less intimidating when you factor in strides in educational attainment. Despite persistent poverty in the region, there are far more children going to school than in previous generations, with substantial gains in secondary enrollment. As healthier and more educated generations move into adulthood, African countries may experience rapid declines in fertility and mortality. Lutz’s team determined that between the best and worst-case scenarios of future educational expansion, there’s a difference of more than 1 billion people in projected population growth. In contrast to recent projections from the UN that world population could grow to 10 to 12 billion by the end of the century, demographers from the Wittgenstein Center project that, based on expected levels of investment in education, world population will peak around 9.4 billion in 2070 and stabilize around 9 billion in 2100. By building data on educational attainment into population projections, Lutz hopes to give policymakers a clearer picture of how investments in human capital will shape the future. Further, improving education is a development goal that is valid for all countries, he says, fully consistent with human rights, and already at the heart of the Millennium Development Goals and forthcoming Sustainable Development Goals. 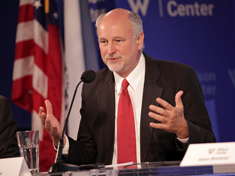 Lutz spoke at the Wilson Center on October 23. Sources: The Brookings Institution, UN Population Division.